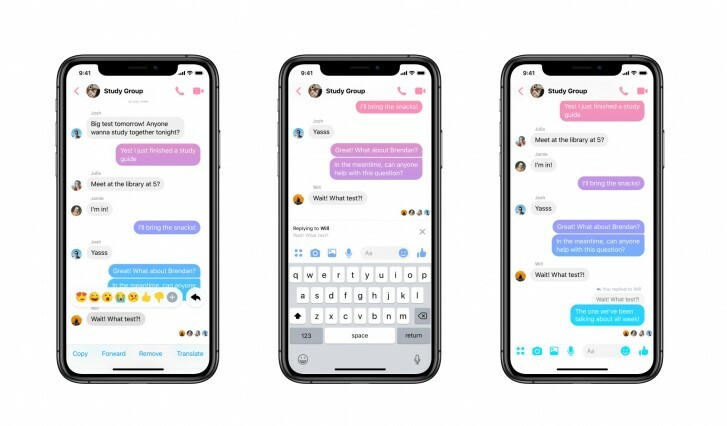 Today Facebook Messenger has added one of the highlighted missing features and that’s the quoted replies look. This allows the user to reply to an individual message in a conversation. This is quite helpful to the users when you’re entered into a chat conversation. This is what most of the users want just like the WhatsApp quotes messages. By using this feature, both the sender and recipient will be benefited to search for messages properly. WhatsApp chat messaging application already using this feature for so long. After owned by Facebook, it’s quite obvious that the company will introduce that feature on its own app. However, the update is rolling out after a long time. Though the Facebook Messenger app needs to be more polished and fluid like WhatsApp. There is a kind of sluggishness can be found always on the Messenger app which you can find better during the conversation with up to 5 or more individual contacts. If you want to get the new WhatsApp like quoted replies on a specific message, just long tap on it and you’ll see a new Reply button right of the emojis. Tap on it and write your reply. You can also swipe from right to left on a specific reply to get the quoted message option. Now, just like WhatsApp, the reply message will appear above your reply. That’s Easy. The feature is rolling out on both Android and iOS platforms. The new update was first noted by VentureBeat and the feature will be useful to all of the users expectedly. As we all know Facebook recently rolled out the Messenger dark mode officially.